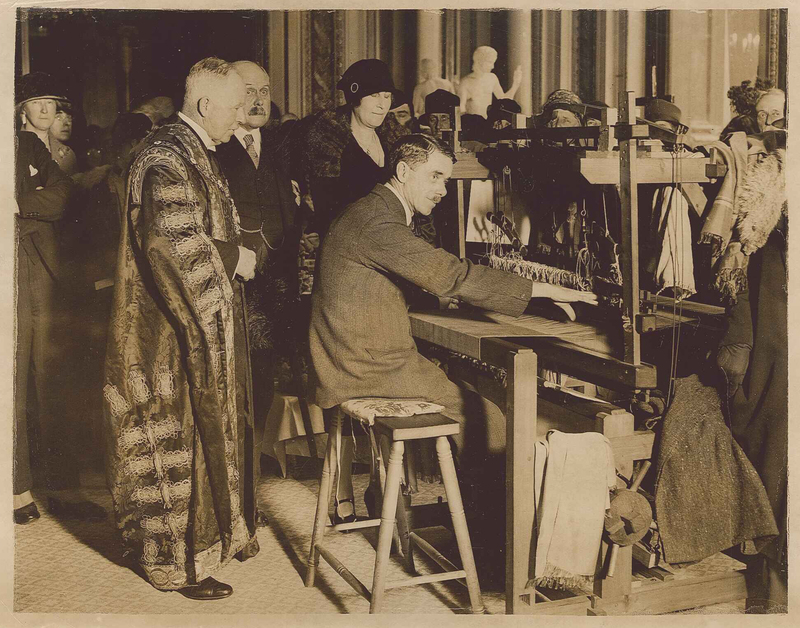 A loom taken apart in 1927 is available from the Drapers Hall in The City of London. The loom is in pieces and is regarded as a fire hazard as it is wooden, so needs to find a new home. The loom is in need of a good wipe down and needs to be reassembled, so there are no details of its width or general dimensions. There is slight rust on the warp shafts at front and rear, but appears to be complete but however, apparently there are no heald frames. The photo shows the last (and possibly only) time it was used, so can give some indication of size. The loom is available free of charge to anybody who can provide a good home for the cost and effort of collection in a van. First come first served. This entry was posted on Friday, November 29th, 2013 at 10:05 am	and is filed under General. You can follow any comments to this entry through the RSS 2.0 feed. You can leave a comment, or trackback.